ALMACO Group has today received the Internationalization Award of the President of the Republic of Finland for its achievements in international business operations. 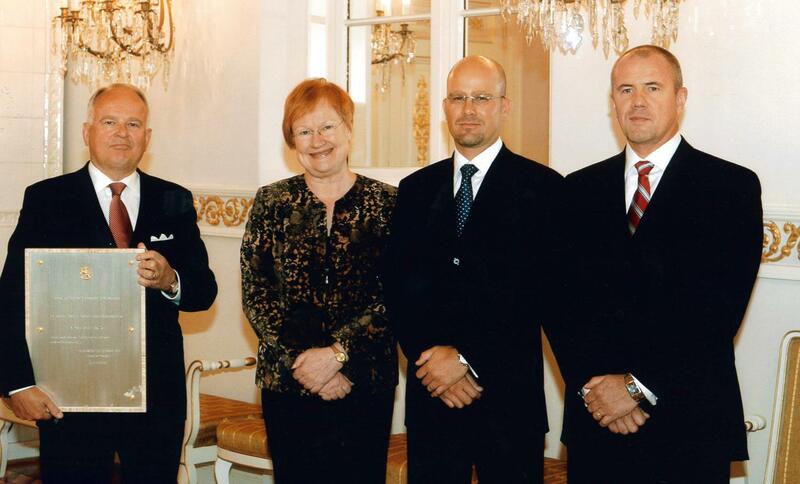 Executive Chairman Ulf Hedberg, Executive Vice President Mikael Hedberg and President Vilhelm Roberts have received the award from the President of the Republic of Finland Tarja Halonen in the Presidential Palace. The Internationalization Award of the President of the Republic of Finland Award can be presented to a company or community that has actively participated in developing international Finland. The preparatory work and the choosing of the candidates for the Awards is done by Finpro in collaboration with the Association for Finnish Work. The Awards are donated by The Finnish Fair Corporation. ALMACO Group was founded in 1998 and has grown profitably for 8 years and systematically extended its presence in the global marketplace.